PORT CHARLOTTE, Fla. — The Tampa Bay Rays offer a simple response to critics of the team's creative use of openers to fill out their pitching rotation. And, they plan to do it again this season, when they expect to contend for a playoff berth after winning more games in 2018 than any major league club that didn't make the post-season. "At the end of the day, our motives are to win games and put our players in the best position that we believe possible to help us accomplish that. ... That will continue to be our guide," senior vice-president of baseball operations and general manager Erik Neander said. "We're going to do what we feel is best for our organization and our players," Neander added. "If that leads to winning games, that makes everybody happy." 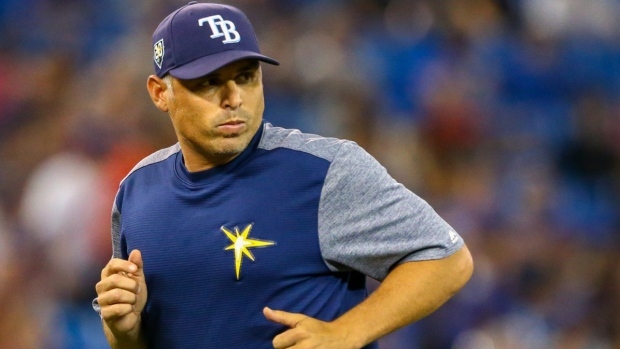 The Rays are coming off a turnaround season in which they won 90 games, in part because of the successful use of relievers to open games on days manager Kevin Cash elected to not begin with a traditional starter. An opener generally faced three to nine batters, depending on matchups — primarily with a goal of getting the first three to six outs of a game. Cash also used "bullpen days" — outings started by relievers who usually worked deeper into games — when necessary after injuries and a series of salary-slashing moves left Tampa Bay without a customary five-man rotation. "We're going to have very similar plans as to what we did last year," Cash said, citing depth and versatility as biggest strengths of not only a mostly young pitching staff led by 2018 AL Cy Young Award winner Blake Snell, but of the entire roster. "We have a lot of guys who can play different roles, that can hit in different parts of the lineup," Cash added. "And we showed last year we've got a pretty special pitching staff that can pitch in different parts of the ballgame, and we're going to utilize that again." The Rays, who reported to spring training this week with a projected season-opening rotation of Snell, Charlie Morton and Tyler Glasnow, used traditional starters 84 times last season. Openers took the ball first 55 times, with Tampa Bay going 32-23 in those games. The remaining 23 starts were filled with bullpen days. "We have a young roster. They're willing to do, I think, whatever is asked of them and trust," Neander said. "At the end of the day, I appreciate the trust they have in (Cash) and the staff to put them in the best position to succeed," the GM added. "We saw what's possible when you have that in place." Other big league teams have taken notice of Tampa Bay's success and have explored variations of the concept. While the club notes the approach to using the bullpen has contributed to the development of young pitchers such Ryne Stanek, Ryan Yarbrough, Yonny Chirinos and Jalen Beeks, skeptics argue the concept devalues the role of traditional starters and also can undermine a pitcher's earning potential. Cash reiterated that a big part of Tampa Bay's success was the willingness of veterans, as well as younger players, to buy in to the concept that made its debut May 19. From that point on, Rays pitchers had the third-best ERA (3.50) in the majors behind the Los Angeles Dodgers (3.19) and Houston Astros (3.39). "We certainly value our players quite a bit. And looking at what some of these guys did, whether it was the opener or the bullpen guys who followed them, they all had pretty special seasons," Cash said. "All those guys bought in, and we're going to need that again," the manager said. "But I also think they really valued and cherished winning games. And that helped us win games."